There is simple joy in waving around your money. You can face your environment with a sense of personal achievement and instilled power and potential. The world seems more open with money in your pocket. But it also loves to separate you from it as quickly as possible. So fast that you might never have that feeling of gratification and empowerment to begin with. So what if you could have personal money based on the things you value in life? As a reminder that money is just a means to an end. Raising the question if you control money or does it control you? How does a currency work in such a way that it values and serves people instead of the other way around? EGONOMIA is a pop-up currency that experiments with new values, behaviours and outcomes. 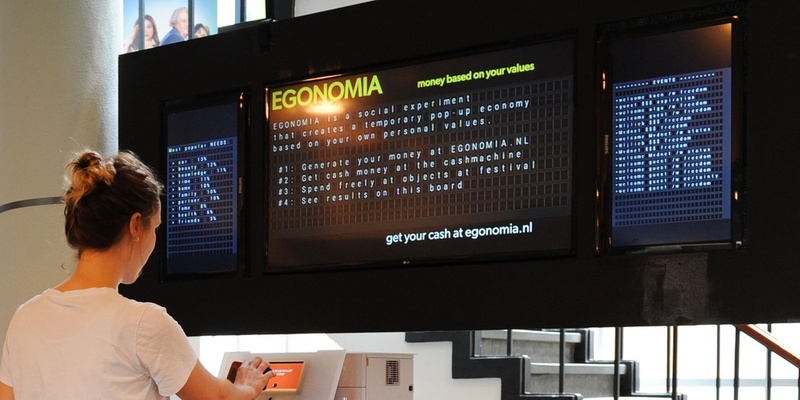 It was first held at the Economia festival in Eindhoven april 2017 and consisted of an ecosystem of familiar economic objects; a cashmachine, cashregisters and a lot of transactional objects like billboards, tipjars, voting jars and even a gambling machine. Instead of the (relatively) neutral euro, yuan or dollar this currency starts with the personal values of participants generated by an online questionaire. There are six denominations in circulation: freedom, status, care, certainty, community and aspiration. Depending on their answers people got four of these bills from the cashmachine to spend freely. Every note was imprinted with an individual motto or interpretation of that value. This intimate uniqueness had people exchanging beliefs and opinions before even spending their money. Cash in hand, participants did transactions related to drinks, tickets and more. Buying a drink and giving it to a stranger referred to the value care, gambling expressed freedom and a VIP treat could be bought by people who value status. At every transaction the participant was confronted with the value on which he spend his money and could monitor and reflect on the results of the whole economy on a big screen. The most popular denomination was freedom - both in bills printed as in transactions – but others weren't far behind. Most importantly participants embraced these values as evident, important and connected to their own life. Their motto's show consistent meaning and hint at practical implications. The bills led to numerous transactions but also to interesting changes in social behaviour; Some people were positively surprised by the coffee offered by a complete stranger and it has never been so easy to organize rounds of drinks between friends. Because of the presence and ease of the ecosystem it was quickly adopted among the existing pinmachines, creditcards, cash money and other transactional objects. The experiment showed how quickly these economic infrastructures are adopted, move to the background and powerfully shape behaviours as unconscious technology. Maybe we don't need a new economic system – as is sometimes said - but rather constantly create parallel and competing ones by which we become conscious of their mechanisms. In the words of Richard Feynman: “What I cannot create, I do not understand”. The next fase of EGONOMIA is the creation of a local currency within the Strijp-S Eindhoven district and an parallel economy that integrates non-monetory values like knowledge, innovation, collaboration, sharing, volunteering and can run and be governed as a self-supporting system. For now I love to think that in some wallets are bills reminding the owner of the meaning and importance of freedom, care or certainty and are waiting to be taken out once again when there is an economy to receive them as valuable and impactful. Egonomia from OSCity on Vimeo.